IT promises to be a nervy 24 hours for one Ireland's star athletes in the UAE– with Wicklow's Aisling Beacon having to wait for a decision on whether she will make the podium after a gruelling 1600m swim in the sweltering Arab sunshine. Competing in the Open Water contest, Aisling (39) was roared home in Dubai by friends and family, some 16 years after she first entered the Games in Ireland in 2003. Despite a strong finish, divisioning of athletes for the swim was still not complete more than two hours after the swim was finished and the swimmers must wait until tomorrow. But it was all smiles from Aisling and proud mum, Pam as she congratulated her daughter upon leaving the water. "Brilliant, great it was, absolutely brilliant," Aisling told Independent.ie. Roaring her on from the beach, Pam said "I was delighted for her". "It's a tough oul race and Aisling has had a lot of problems with her hips and I was worrying all along if she'd be able to finish but she finished very strongly, very strongly," Pam said. Aisling put off a hip replacement to compete and has had hip work done by former Irish Olympic swimmer, Gary O'Toole who is an orthopaedic surgeon. "He rushed her hip replacement last year so she would be ready for it this year and she's to go back and see him after this," Pam said. 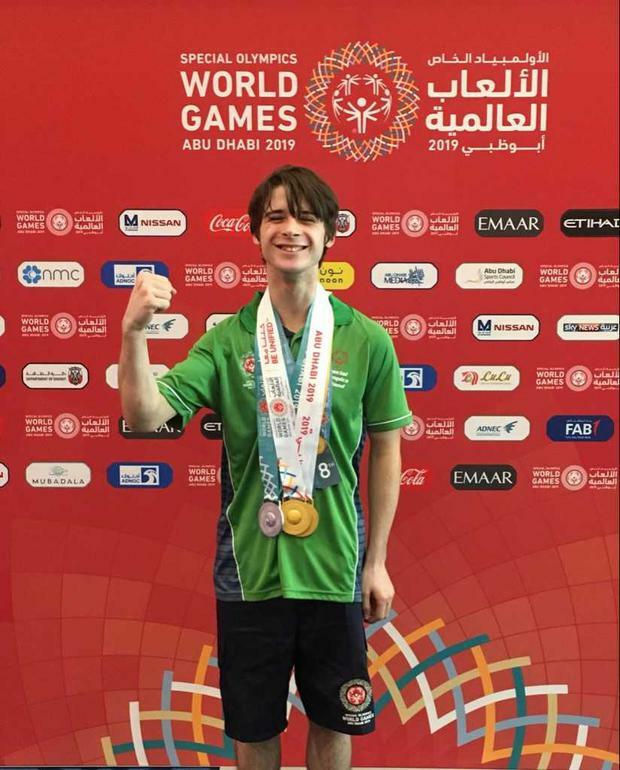 Meanwhile, John Keenan (19) from Westmeath had a similar wait for his medals after competing on Friday, but boy was it worth the wait, as he collected two gold, a silver and a bronze in his first ever World Games. Speaking after the medal ceremony John said he was over the moon. "I'm really happy and have made my family really proud, I hope the rest of Ireland is proud of me too." It brings the total Irish medals to 15 which include 10 gold, two silver and three bronze after less than two days of action in Abu Dhabi and Dubai.